Old School Wednesdays presents an epic reread of The Harry Potter series by J.K. Rowling. THIS MONTH ON THE RE-READ: we take a look at book 4. This re-read continues to surprise me, I am finding new things in these books, rethinking what I liked before versus what I like now. It’s a great exercise in looking at one’s reading memories and revaluating one’s reading experiences. I remember distinctly loving Goblet of Fire before. Not so much now. In fact, I love precisely one quarter of this book – the last one. But I will get to it later. The problems with Goblet of Fire are many. Although one has to admire J.K. Rowling for the different threads expertly woven into the novel – So. Much. Foreshadow – the fact remains that most of the novel’s plot is protracted, boring gibberish – omg did I just say that out loud? I feel a little dizzy. I am not a huge fan of the Triwizard Tournament for many reasons: it beggars belief that such a dangerous tournament featuring teenagers was allowed to happen in the first place. The lead up to each task is boring. The tasks themselves are underwhelming and underdeveloped by the time they show on page. But the biggest problem is that the tournament and Harry’s participation is completely, 100% unnecessary. Consider that Crouch-Moody had to find a way to fool the Goblet, that Harry had to go through all this, participate on the tasks, take part on a tournament that lasted MONTHS so that he could… Touch a portkey. Bearing in mind that Crouch-Moody had a placement as a trusted teacher at Hogwarts for almost one year with plenty of opportunities to just, oh, I don’t know, hand over to Harry a parchment, a pen, a book – anything, really – that was a portkey at any. Given. Time. It is all just so convoluted. Since we are on this subject: are we going to talk about how Crouch-Moody was able to fool the most important wizards in the Wizarding World for almost a year? Actually, no, scrap that: maybe that is a good thing. Maybe that is just another facet, another way of reinforcing the idea that just because magic exists, it doesn’t mean that things are magically solved or that wizards and witches are perfect. Definitely scrap that: in fact, this is possibly my favourite aspect of the book. How slowly but surely, Rowling is unveiling this world to show us how people like Voldemort can rise, where fascist wizards are a dime a dozen and House-elves are an actual thing that exists. On that latter subject, I am not sure how I feel about SPEW and Hermione – do we see a touch of White Saviourism there? Why is Hermione the only one who cares? Why is Dobby the only House-elf who thought differently and why wasn’t Dobby the SPEW’s creator? Plus, I’d understand the Malfoys having a House-elf but the widely-spread accepted usage, abuse and way of thinking about House-elves (“BUT THEY LIKE IT”) is gross – especially for a story taking place in the 20th century. I stand with Hermione in befuddlement when realising that Hogwarts runs on House-elves. Dumbledore, Minerva, what even. I can’t form words coherently. I remember being really upset that the movies cut the House-elves storyline but now maybe I think this is a godsend because what a mess. 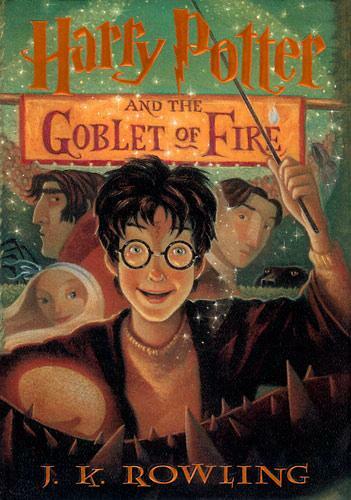 With that said, what did I like about Goblet of Fire? Everything featuring the adults. Everything about the history of Voldemort’s ascension to power and his return now. Dumbledore’s Pensieve. The Death Eaters. The Unforgivable Curses. The Longbottoms’ story- actually all the terrifyingly sad stories of that entire wiped-out generation of wizards. Dumbledore’s speech in the end and the start of the Order of Phoenix: anyone else got goosebumps at Dumbledore’s call to action to Sirius, Snape, Molly, Arthur, Minerva? That moment was awesome. Harry and Voldemort’s showdown, the two wands, the ghosts and Cedric’s “take my body back to my parents, Harry”. I cried. It’s clear though I disliked more things than a I liked about Goblet of Fire. It’s possible GASP that I liked Chamber of Secrets more. Talk about a revelation. I loved the book anyway. Let’s knock these out systematically, shall we? First: the House Elves, SPEW, and Hermione the White Savior syndrome. When I first read these books I was much younger and largely unaware of the issues present in the text–and as such, didn’t see much of an issue with SPEW and Hermione’s crusade to save the House Elves from others and from themselves. Upon rereading now as a more attuned and critical-thinking reader, it’s impossible not to notice the huge glaring problem of Hermione’s White Savior storyline. This thread is particularly problematic because it highlights a key problem with White Saviordom–the fact that Hermione never once asks or tries to understand what the House Elves themselves want. No, instead she finds ways to trick them into freedom–a freedom that she herself has ascribed to being what the Elves must want. I agree with Ana in questioning why Dobby was not the voice and leader of SPEW (a much more subversive message that is actually about the House Elves and not about Hermione’s personal need to save and liberate the Elves). I don’t object to the examination of the House Elves servitude to Wizards–it’s an awful system, and one that makes readers see this Wizarding world isn’t all chocolate toads and butterbeer; I just wish it had been more thoroughly examined and subverted. The interplay between Harry, Hermione, and Ron is fantastic per usual–the sprinkling of Sirius is also awesome. I very much love how much Harry, Ron and Hermione are growing with the series–this book in particular shows how different each of them are. Further, as Ana says, I love the cast of adult characters and the struggle of the memory of Voldemort that they each face–the Dark Mark is introduced here, along with the Death Eaters, Dumbledorre’s pensieve, and more. It’s all SO SO COOL. This is a classic case of long book, lots of bloat… but it’s good bloat. It’s the kind that I like to read, complete with Hungarian Horntails and the like. Take that as you will! Also, at the end of the day, The Goblet of Fire is the book that changes everything–Voldemort is back, and things will never, ever be the same. It’s about to get dark, people. I find it funny that I’m so often willing to forgive J.K. for things that don’t make sense – it often feels like a flaw that makes it even more lovable somehow. That would be things like the Triwizard tournament and the fake Mad-Eye Moody still giving Harry decent advice sometimes. Not so the issues with house elves, which were and are disturbing, and now seem to foreshadow her treatment of Native Americans in her recent short fiction on Pottermore. It makes me so, so sad. Hermione’s treatment of the House Elves. Yes, it was dodgy – but I could also never understand why she was the only one being dodgy, if you get my drift. How many Muggle-raised students are at Hogwarts? You’d think at least one of them would have a problem with this. Dean Thomas, for instance, who actually *was* black (none of this lily-livered retconning from JKR about minority characters deserves anything but scorn) could have had something to contribute about the history and consequences of slavery. Or Harry, who actually lived the life of indentured servant with the Dursleys – he has nothing to say about it? And all the Muggle-borns who go into Hufflepuff? WHERE THE HELL ARE THEY ON THIS??? Ludicrous, all of it. If you’re going to bloat a book this badly with extraneous detail, at least bloat it in a sensible direction. Give Hermione a group of people who genuinely sympathise with her shock and disgust but who go about things better and call her out on her attempts at Saviourdom. And yes, as much as it goes against the grain to say it – Dobby ties for first place with Jar Jar Binks in the “characters Octavia finds horribly annoying and would like to punt” – involve the Elves more in their own goddamn story! I’d seen the stuff about how Hermoine could be black right before I started this re-read, and I’m trying to go through the series with that lens in place. The SPEW storyline is so much better with that headcannon accepted. I don’t think Hermoine would unthinkingly accept the treatment of house-elves, but as a character of color, how could she ignore that injustice? BTW, as a reader, I always accepted that Hagrid’s assement of House Elves as needing to work, and his statement about Dobby that “every species has it’s weirdos.” as indicating that a need to work is part of who they are as magical creatures. As the character with the most knowledge about magical creatures, I was willing to accept his assessment, and assume that Dobby was a little unbalanced because of how the Malfoys treated him. Any maybe Hermoine knew this, and that’s why she didn’t go to talk to the House Elves directly – on some level, she knows it’s more about her than it is about them. Is that a fair reading? I don’t know. I do, still, love Hermoine’s relationship with Victor Krum, and how invested he is, and how she barely cares at all. I hadn’t noticed how into her he was in earlier readings – or thought about how her status as a muggle-born witch might influence that relationship. I feel like I’m a mash-up of Thea’s and Ana’s response to GOF; I have all the problems but still love the Triwizard tournament because I, also, adore an arena story. ALSO. The Crouch-Moody thing! HOW does Dumbledore et al not notice that someone he’s known for DECADES is actually an imposter?! They must be some lousy friends! I completely agree that the house-elf storyline is problematic, but I’m not sure that it is a straightforward White Saviour problem. To me, a White Saviour storyline is at its most problematic when the author seems to be saying that it’s OK, and I’m not at all sure that that’s what’s going on here. It’s not clear that Rowling actually thinks Hermione is doing the right thing by the house-elves; I’m not sure it’s even clear (at least from this book; I know there’s more house-elf stuff in later books but I can’t remember what it is) whether Rowling thinks house-elf enslavement is OK or not. The impression that I get from the book is that Hermione has noticed a genuine issue that everyone else is ignoring, but that being fourteen years old and on her own she’s not going about it in the right way. It feels to me like Rowling is *trying* to problematize the White Saviour narrative, but she’s stuck it in a subplot and not articulated it very well and, in fact, done the exact opposite to what she intended it to do.